Les Sablons Campsite is what a great French holiday is all about. Indulge your artistic tendencies at a workshop, take a magical bike ride along the idyllic Canal du Midi, and treat the children to a fabulous water park and yourselves to the many delights of Portiragnes Plage. Sound like fun? At the luxury camping site of Les Sablons, a world of excitement and fun awaits your discovery. 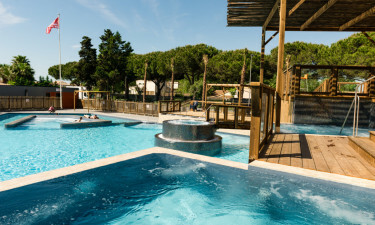 Why choose Les Sablons Campsite? From toddler to experienced swimmer, the heated outdoor pools are designed to accommodate all. Toddlers can splash about in their own pool that features colourful fountains, water games and mini-slides. Older children can ride the water slides and twisting chute of the plunge pool. There are two large family pools, including one with lanes for swimming lengths. The sun terraces have shaded areas and an ample supply of loungers for relaxing after a dip. The spa area is restricted to adults only and features a lazy river equipped with 4 Jacuzzis, submerged loungers and direct access to the bar and multi-level wooden sun decks. Work on that tan and tone those muscles at an aquagym or aguabike class in the pool; or why not try a step class or beach volley ball session, followed by a refreshing dip in the Mediterranean. An air-conditioned gym, plus tennis, basketball, badminton, running track and table tennis await your convenience, whilst youngsters and adults alike can have a go at archery and compete in various tournaments and games. The mini club keeps younger children active with fun and games, both on-site and at the beach. Teenagers can go horseback riding, tree climbing in the adventure park and much more. The campsite’s theatre hosts live music, cabaret, dancing and other spectacular evening events. The whole family can join in the partying on the barge trip along the Canal du Midi, the real highlight of a stay Les Sablons. 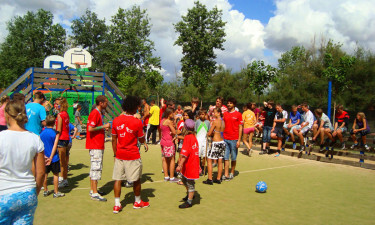 The campsite also offers a guided tour by mini-bus. Taking in such historical sites as the Saint-Nazaire cathedral and Montady Lakes, it is an ideal opportunity to discover the rich history of the region. Bèziers is just 7km away. The capital of Languedoc winemaking, it is one destination not to be missed. The Le Jardin des Sablons restaurant serves excellent cuisine and has a terrace for romantic evening meals. 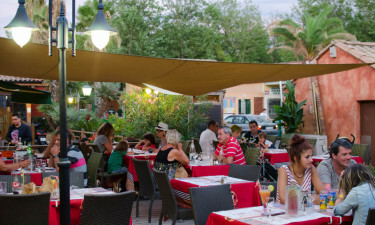 The bar also has a large terrace from which the campsite entertainment can be enjoyed. A supermarket, bakery and international newsagent cater to all your luxury camping needs. There is a great market twice a week at the nearby town of Portiragnes.